Posted May 28, 2015 by Bailey Heard & filed under Blog, FeaturedOnHomePage. Hope you had a wonderful memorial day! I spent some much-needed family time with my daughter and my in-laws at their lake house! This past month has been such a whirlwind from San Diego, to Los Angeles, to Atlanta, to New York that I really enjoyed the downtime. As fun as it’s been, I’m ready to be home for a solid amount of time to regroup and spend some quality mommy-daughter time. 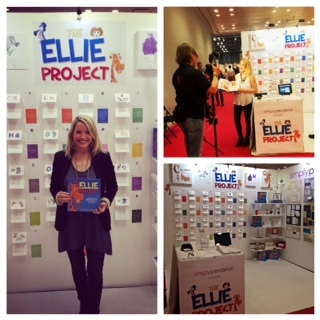 Going to New York to launch The Ellie Project book, along with the stationary line and other products, was a huge leap of faith. It was certainly an investment in more ways than one. Overall we made some strong connections and I’m excited to see where those might lead. Originally I decided to get The Ellie Project published so Ellie would have a quality book written for her by her daddy. Then the idea that Andrew’s drawings and inspirational messages could touch the lives of other families became important to me because I knew Andrew wanted to reach as many people as he could with his message of faith and love. The vision for The Ellie Project continues to grow. Perhaps one of the best moments for me was when I sent Andrew’s parent’s “The Ellie Song.” Their tearful response was that it was the best gift they’ve ever been given. Their words moved me and encouraged me to keep being open to the possibility of growing and developing The Ellie Project in hopes that Andrew and his message will positively impact families all over the world. I always knew Andrew was something special. The spiritual, mental, and emotional depth he possessed immediately connected with my soul. It is such an honor to share Andrew’s depth of character with the world because for me and everyone else who knew Andrew, just being around him inspired one to be better and more than they ever thought they could be. So I’m carrying the torch forward by seizing every possible opportunity and taking a huge leap of faith that God’s plans for The Ellie Project will be carried out as He sees fit. I have my seasons of doubt where I doubt my abilities as an entrepreneur, as a coach, as a person, and ultimately I ask God for strength and direction and keep moving forward. Have you ever gotten the gut feeling you should take a leap of faith, but you doubt if you have what it takes to see it through? Whether it’s a new relationship, a new job, becoming a parent, or starting your own business, trust that you are beyond capable of figuring out the “how”. It doesn’t mean it’s going to be a walk in the park, but keep your mindset one of commitment to growth no matter what ups and downs come your way, and then watch yourself blossom in confidence as you move toward creating the life you truly want! You’ve got this! Please check out my new website www.baileyheard.com ! In honor of my new website launch, I’m running a limited-time new client special for my Next Chapter Coaching package! Feel free to contact me through my website to ask about the details and to see how I can support you as you move toward creating a passionate, purposeful, and joy-filled life! Looking forward to hearing from you! Love and Blessings. Check out Ellie’s reaction to seeing The Ellie Project for the first time! It’s priceless!